Finally I made it this summer to a film at the NC Museum of Art's summer lawn series! I have wanted to see Mad Hot Ballroom since it came out last year, and tonight was my chance! 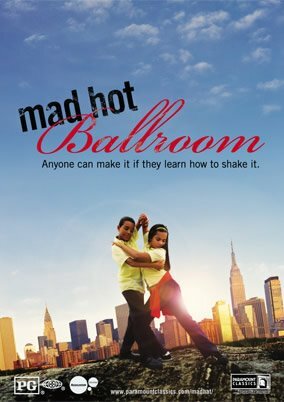 It is a documentary about New York City students in the (I believe) fifth grade who learn ballroom dance and compete in a city-wide competition, going from quarter-finals through the finals. I loved the dance and music (if only my wife and I could learn swing! ), but mostly relished seeing how the children approached their task at hand. They were, for example, coached that demeanor counts and to smile - this at an age where children often shun those of the opposite gender.